Former Gov. Jesse Ventura filed suit Monday against HarperCollins, the New York publisher of the book that a federal jury in St. Paul said had defamed him. In July Ventura won $1.8 million from the estate of Chris Kyle, the late Navy SEAL who wrote the bestselling memoir “American Sniper,” which included a subchapter about an alleged California bar fight between him and a man he called “Scruff Face” and later identified as Ventura. Ventura, who is also a former member of a SEAL unit, successfully argued that the bar fight and disparaging remarks he made against Navy SEALs attributed to him in the book had never occurred. “American Sniper” has been turned into a movie directed by Clint Eastwood and starring Bradley Cooper with a limited release in theaters on Dec. 25. There has been no indication that the incident involving Ventura is included in the movie. Kyle was killed in an unrelated incident after the book was published in 2012, and Ventura continued the suit against the estate, headed by Kyle’s widow, Taya. Ventura’s attorneys presented evidence at the trial that the book permanently damaged his reputation among former SEALs, with whom he had a long and friendly association. Taya Kyle’s attorneys have appealed the verdict to the 8th U.S. Circuit Court of Appeals. Ventura notes in the new suit that U.S. District Judge Richard Kyle, who had presided at the trial, had defended the jury verdict in a subsequent order in which he said that Ventura had convinced the jury that the book sales had benefited from the defamation of Ventura. The suit was filed by David Olsen, who was Ventura’s lead attorney in the defamation trial. In the suit, Olsen asks for $150,000 but it is anticipated he will seek a lot more in settlement discussions that normally precede a trial. Olsen did not return a reporter’s request for comment. The suit was filed in federal court and is now a public document. However, Erin Crum, HarperCollins vice president of corporate communications, said the company’s attorneys had not seen the suit, and she had no comment. Now isn’t that special? Ventura is living in MEXICO! Good riddance! He’s one to talk about honor and lying. What a jackass. His ‘winter home’… here’s a good piece of advice Ventura… STAY the hell down there!!! WE DON’T WANT YOU HERE YOU DIRTY SCUMBAG! Thank you, reasonablyliberal for posting this! “American Sniper” is doing well at the box office but don’t expect to see Jesse Ventura heading to the theater for it. According to the AP, the former pro wrestler and governor Jesse Ventura (who was also a former Navy SEAL) says that he won’t go to see the movie. Ventura won $1.8 million in a defamation lawsuit last year against the estate of the late Chris Kyle, the SEAL protagonist of the movie, which has sparked debate over whether snipers should be considered heroes. Ventura said Wednesday he won’t see the film partly because Kyle is no hero to him. “A hero must be honorable, must have honor. And you can’t have honor if you’re a liar. There is no honor in lying,” Ventura told The Associated Press from his winter home in Baja California, Mexico. He also noted the movie isn’t playing there. Jesse Ventura | Navy SEALs. Jesse Ventura was suing for defamation of character. His name was not even in the book. Kyle was being interviewed and someone on the phone asked if it was Ventura and he acknowledged that it was. Ventura defamed what little character he had left by finishing this lawsuit. He is so proud of himself. The former WWF Jesse ‘THE BODY’ Ventura didn’t have the mat to fall on when Kyle pushed him and Ventura fell back. How much had Ventura had to drink? His big mouth said, “The SEALS could afford to lose a few.” I double dog dare him to show up to any SEAL event! He is a phony, always has been, and apparently always will be. How the people of Minnesota would have elected this idiot as Governor is beyond me. What a sorry excuse for a man. The link above is taken straight from the Navy SEALS website regarding Jesse Ventura. It is only factual regarding his military career. He was part of the predecessors of what we now know as the SEALS. You can click the link to see for yourself. His service to our nation is blighted by what he did to Chris Kyle’s widow and her children. What else is there to say? He’s defamed his own name far more than any comment in a book that doesn’t name him but the people that heard him on Glenn Beck’s radio show heard that it was. And Kyle shoved him, he didn’t punch him. I guess Ventura was expecting a WWF mat to be behind him as the wrestlers all talk trash to one another to make money. Boo hoo, Jesse. How much did you have to drink before you had the gall to make that statement “The SEALS could stand to lose a few.”???? In a bar full of Navy SEALS, I think that was the most asinine thing you could have said and not expect some type of reaction! You were looking for a fight, so you could sue someone. Shame on you for continuing on with the lawsuit once Chris Kyle was killed. You should have shown some decency and dropped the suit against Kyle which now became his estate. So now you think you’ll get your $1.8M? Not if his widow has to file bankruptcy. But I hope she files for an appeal and that real people hear the case and that YOU will have to pay HER $1.8M after all, you should have amassed quite a fortune with your WWF wrestling career and your political career. I KNEW his name was not Jesse Ventura until he became a wrestler because he said he chose Ventura from the map of California. Below is from Wikipedia. 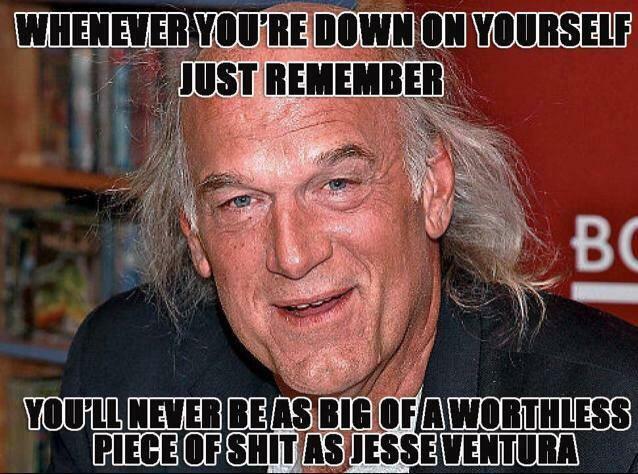 James George Janos (born July 15, 1951), better known by his stage name, Jesse Ventura, is an American former professional wrestler, color commentator, actor, author, TV host, podcaster, naval veteran, and politician. This just in… article by another SEAL Brandon Webb. There are so many more… just surf around… not to many see him as a hero anymore and some even have petitioned to have him removed from the UDT/SEALs for his actions! Jesse Ventura served during the Vietnam War and I don’t like to speak against Vietnam Vets but this man has discredited his service by what he’s done. Now he is defaming Kyle’s name, should Taya sue him? She has too much class for that!